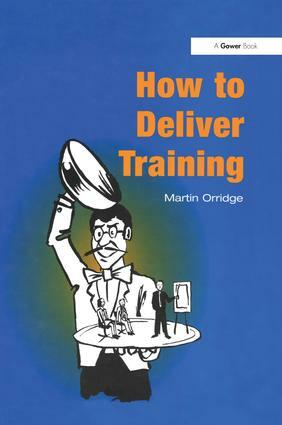 'The aim of this book is to provide both managers wishing to run ’in team’ exercises and those entering the training profession with a practical guide to delivering successful developmental events', says Martin Orridge in the Preface. He writes as an experienced trainer and consultant, producing a very human guide to the realities of running a training event. In a brief introductory section he explains the need for training and the benefits it can bring. Part 1 of the main text shows how to design a successful training session and Part 2 deals in detail with preparation and delivery. At the end is a collection of model documents and forms that can be used at various stages of the training cycle. The text includes tips, tools, checklists, examples and exercises throughout, together with real-life anecdotal ’cameos’ to help make the points memorable. Martin Orridge’s style is at all times practical and friendly. How to Deliver Training will be welcomed not only by professional trainers, but by all managers and team leaders concerned with staff development. Contents: Introduction. Part 1 Designing a Successful Training Event: Identifying people development needs; How people learn; Event design; The excellent trainer. Part 2 Running a Successful Training Event: Before the event; During the event; Closing the event - and beyond; A compendium of forms and documents; Recommended reading; Index. Martin Orridge is a training and organizational development consultant working with a wide variety of clients in both the public and private sector. Prior to becoming independent he worked in the telecommunications, pharmaceutical, electronics and IT sectors and has undertaken consulting and training assignments in the UK and continental Europe. Mr Orridge is a visiting lecturer at Bournemouth Business School and is the author of 75 Ways to Liven Up Your Training (also published by Gower). He is a Founder Associate of Atticus Ltd., the Enterprise MappingÂ® consultancy, and a member of the Institute of Management, the Institute of Management Services and the Association for Management Education and Development.